Every garden needs a pond. If not for use or ornament then to satisfy the demands of sustainable water management. Water should be detained and infiltrated as close as possible to the point where it falls. In other circumstances, it is necessary to line the hollow with a water-retaining layer. It might be of concrete, butyl, metal or clay. Fiberglass is popular, but it is ugly. There are many pond kits on the market. a rigid fiberglass pond liner: this is significantly more durable than a flexible pond liner. Precast fiberglass ponds are available in garden centres. They tend to be ugly, expensive and are more difficult to conceal than flexible pond liners. In situ cast fiberglass is better, but even more expensive. waterproof concrete: high-strength structural concrete [a 1:2:4 mix] is waterproof. But the pond needs to be well detailed. If the pond is large it will require expansion joints, waterbars and reinforcement. Concrete is also ugly if visible. lead pond liner. A traditional practive was to use stone to form the shape of a rectantular pond or canal and then to line the structure with lead sheeting. 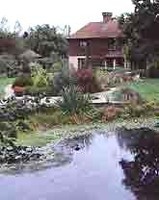 This is expensive for a large pond but remains an excellent solution for a small pond. Lead sheeting is sold in rolls for roofing and can be jointed with a special lead-jointing mastic. The shape of the pool can be formed with cheap concrete blocks or soil-cement. puddled clay. If the subsoil is clay it can be 'puddled' by tramping it when wet to produce a smooth and waterproof layer. Clay for puddling can also be imported. Clay puddled in layers to a depth of 0.5 to 1.0 metres was used in canal building. A potential problem with clay is that if it is allowed to dry then it cracks.